In this lesson, we will learn how to find the number and type of roots of polynomials and how to find unknown coefficients if the roots are given. Determine the type of the roots of the equation ( 2 𝑥 − 4 ) + 1 7 = 0 2 . If 𝑎 + 𝑏 𝑖 is a root of the polynomial 𝑓 ( 𝑥 ) , what is the value of 𝑓 ( 𝑎 + 𝑏 𝑖 ) ? Does the polynomial 𝑎 𝑧 + 𝑏 𝑧 + 𝑐 𝑧 + 𝑑 𝑧 + 𝑒 𝑧 + 𝑓 5 4 3 2 , where 𝑎 is nonzero and all the coefficients are real, have at least one real root? If 𝑎 + 𝑏 𝑖 is a root of the equation 𝑓 ( 𝑥 ) = 0 , where 𝑓 ( 𝑥 ) is a polynomial with real coefficients, which other complex number must also be a root? Is it possible for a polynomial with real coefficients to have exactly 3 non-real roots? How many roots does the polynomial ( 3 𝑥 − 1 ) ( 𝑥 + 4 𝑥 − 2 ) 2 3 have? How many real roots could the polynomial 𝑝 ( 𝑥 ) = 𝑎 𝑥 + 𝑏 𝑥 + 𝑐 𝑥 + 𝑑 𝑥 + 𝑒 𝑥 + 𝑓 5 4 3 2 have given that 𝑎 , 𝑏 , 𝑐 , 𝑑 , 𝑒 , and 𝑓 are all real? Are the roots of the equation 3 𝑥 + 2 4 𝑥 + 4 8 = 0 2 real and different? Given that 𝑓 ( 𝑥 ) = 𝑎 𝑥 + 𝑏 𝑥 + 𝑐 2 has a zero at 3 − 4 𝑖 and 𝑓 ( 0 ) = 1 0 0 , determine the values of 𝑎 , 𝑏 , and 𝑐 . If 7 and 6 are the roots of the equation 𝑥 + 𝑎 𝑥 + 𝑏 = 0 2 , what are the values of 𝑎 and 𝑏 ? If the roots of the equation 𝑥 + 1 3 𝑥 + 𝑚 = 0 2 have a difference of 3, what is the value of 𝑚 ? Find the quadratic equation whose roots are 9 + 7 𝜔 𝑖 and 9 + 7 𝜔 𝑖 2 . How many real solutions does the equation 4 𝑥 + 4 𝑥 = − 1 2 have? Determine the type of the roots of the equation ( 𝑥 − 𝑚 ) ( 𝑥 − 𝑛 ) − 4 6 = 0 , if 𝑚 and 𝑛 are real numbers. Let 𝜔 be a complex cube root of unity. Form a quadratic equation whose roots are  1 − ( 1 + 𝜔 )  − 1 − 1 and  1 −  1 + 𝜔   2 − 1 − 1 . Determine the type of the roots of the equation ( 𝑥 − 1 0 ) ( 𝑥 + 1 0 ) = 2 ( 𝑥 + 8 ) ( 𝑥 + 6 ) . Determine the type of the roots of the equation 𝑥 + 4 𝑥 + 1 = 3 . Determine the quadratic equation whose roots are  2 + 2 𝜔 + 𝜔  2 3 and  − 4 + 5 𝜔 − 4 𝜔  2 3 . 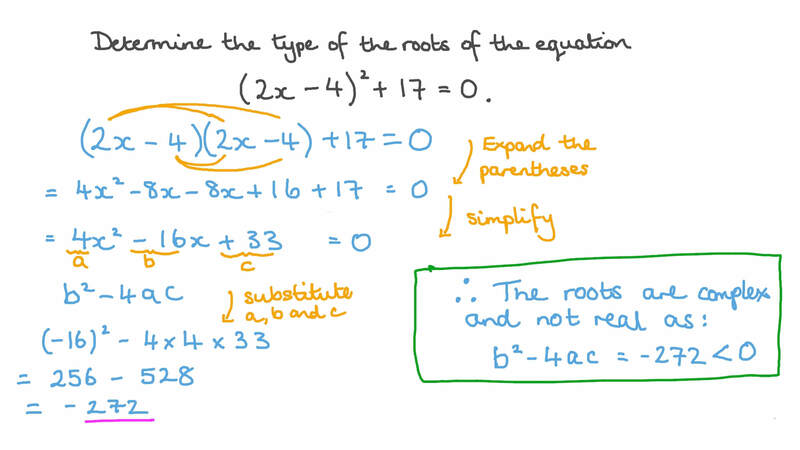 Find the quadratic equation whose two roots are − 4 1 + 𝜔 and − 4 1 + 𝜔 2 .